AshleyNewell.me: Creative Inspirations Paints: Feeling Fruity! Creative Inspirations Paints: Feeling Fruity! Hello friends! I am so happy to tell you that I get to do a second term with Creative Inspirations Paints! I love love love these paints, they make me so happy! This week, we are getting inspired by FRUIT! Any fruit we want. It's awesome because this theme is also on my friend Sarah's blog as a challenge. I pulled out some Basic Grey Lemonade paper. I used my super pretty Creative Inspirations Paint in Sea Foam to make my Thickers match my ribbon and paper. The ribbon is from May Arts and the stick pin is Dritz. Be sure to check out the Creative Inspirations Paints Blog to check out what all the other girls have done! Luv your take on the challenge! This is so bright and happy Ash!! Mmm cherries. Love the design paper. Paint on the thickers is a good idea. Cute card! I agree...the paints make me so happy! I just love the shimmer! This is so cute! I love the paper! Very cute card!! Love the papers that you used!! Great job with the Fruity challenge!! 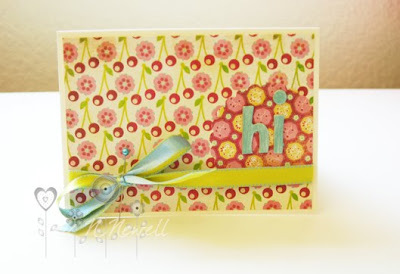 love these papers & this card is so cheery!!! 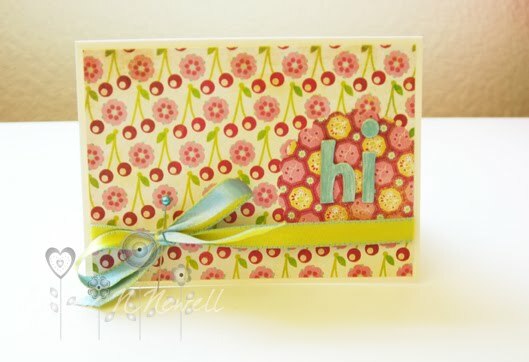 How cute, the BG papers are just perfect for the challenge, and the paints add a nice sparkle!